Hans Köchler (at podium) delivers the welcoming address. 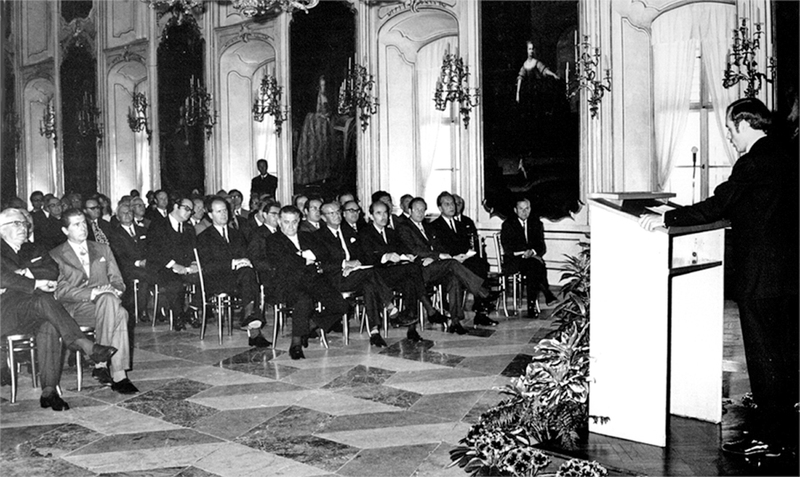 Hans Köchler (right) addresses the opening session of the International Conference on the European Vocation of the Alpine Region at the Hofburg Palace in Innsbruck, Tyrol, Austria (2 June 1971). 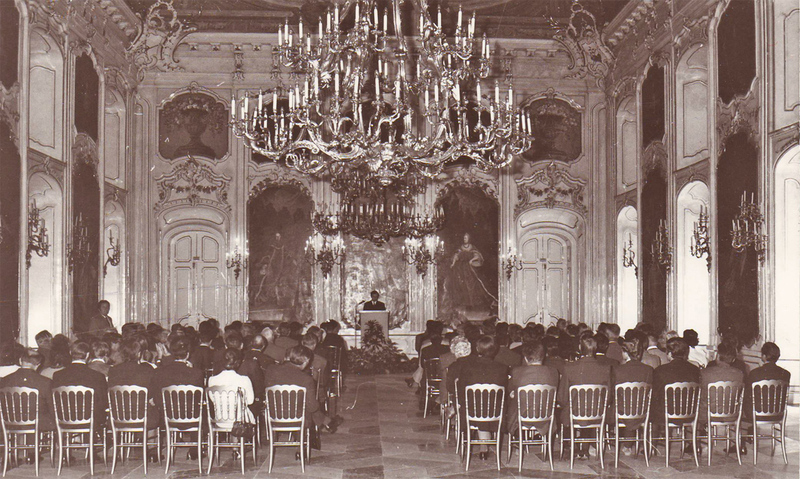 From left (first row): Dr. Alois Lugger, Lord Mayor of Innsbruck; Dr. Lujo Tončić-Sorinj, Secretary-General of the Council of Europe; Mr. Eduard Wallnöfer, Governor of Tyrol; Dr. Philipp Held, Minister of Justice of Bavaria (Germany); Austrian Archduke Dr. Otto von Habsburg; Dr. Fritz Prior, Deputy Governor of Tyrol; Professor Emerich Coreth SJ, Rector of the University of Innsbruck; Dr. Rudolf Kathrein, Head of the Office of the Tyrolean Government. Second row (third from left): Professor Felix Ermacora of the University of Vienna, member of the United Nations Commission on Human Rights. Prior to the foundation of the I.P.O. 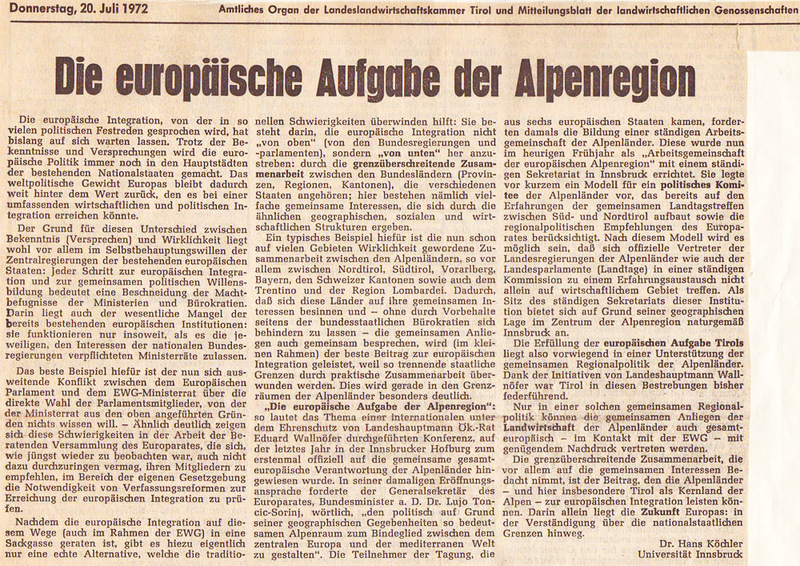 in 1972, Hans Koechler initiated the transnational movement in the Alpine region (1971), to be followed by the establishment of the Arbeitsgemeinschaft Alpenländer (Working Group of Alpine Provinces) in 1972 and the Euregio Alpina in 1973. This initative led to the formation of trans-border regions in Europe, an idea later to be incorporated into the framework of the European Union under the title of the Euro Regions. The promotion of transnational co-operation has been one of the driving forces behind the initiatives of the founder of the I.P.O. » Newspaper article "Innsbruck soll Zentrum der Alpenregion werden"